A second federal contract with a company hired to rebuild Puerto Rico’s all but collapsed power grid is coming under scrutiny, drawing the attention of federal investigators and even members of Congress even as most of the hurricane-ravaged island remains without power. The news of a second faulty contract is also raising questions about the contracting process for the island’s government-owned power company, the Puerto Rican Electric Power Authority (PREPA). Puerto Rico’s crumbling, aging electrical grid was at the heart of the island’s crippling debt and infrastructure problems even before Hurricanes Irma and Maria slammed into it over a month ago. But now, in the wake of recent scandals over contractors hired to fix that very grid, some experts expect the timeline for full recovery to last well into next year. On October 2, PREPA granted Whitefish Energy, a small power company based in Whitefish, Montana, a $300 million contract to rebuild Puerto Rico’s power lines. That contract, which is now the subject of multiple federal inquiries, has only opened the door to broader scrutiny of PREPA, including a contract with another entity, Cobra Acquisitions, which was hired to repair power lines but has scarce experience in disaster cleanup. PREPA CEO Ricardo Ramos has since defended the Whitefish Energy contract by noting that the unknown, tiny company was the only bidder that didn’t require a downpayment, and would handle its own logistics. PREPA is bankrupt and $9 billion in debt, and other better-established companies required significant downpayments in order to offset the risk that PREPA might not be able to pay off contract work. PREPA’s disaster-related contracting actually began in the aftermath of Hurricane Irma, which struck a glancing blow on Puerto Rico on September 6. That storm knocked out a portion of the island’s fragile power grid, and over the next three weeks PREPA held a request for proposals for companies to come and handle rebuilding electricity infrastructure. One of the handful of companies that submitted a bid was Whitefish, a tiny two-man outfit, led by Chief Executive Officer Andy Techmanski. PREPA’s contracting process became an existential problem when Hurricane Maria hit Puerto Rico on September 20 as a Category 4, all but obliterating the grid, and potentially plunging the island into darkness for months. On September 26, Techmanski visited the island to follow up with PREPA officials directly about a potential contract with Whitefish—which retained no linemen on staff, and had never been involved in a disaster scenario—and its expertise in rebuilding power lines in mountainous, remote areas. In a dark conference room under the lights of cell phones, Whitefish and PREPA officials hashed out a plan. The provisions of the Whitefish contract raised concerns when its contractors arrived on the island two weeks later. The contract stated that FEMA—the federal agency paying for PREPA’s disaster-related expenses—had reviewed and authorized the contract, but the language also charged exorbitant rates for logistics and housing of contractors and exempted certain provisions from FEMA’s scrutiny. 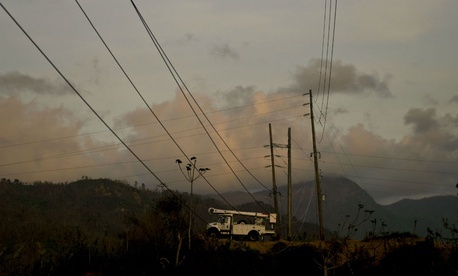 A later statement from FEMA said that it had not seen the contract, stating that “any language in any contract between PREPA and Whitefish that states FEMA approved that contract is inaccurate.” Whitefish, which declined comment for this story, also raised eyebrows after by engaging in a public Twitter feud with San Juan Mayor Carmen Yulín Cruz and seemingly threatening to send back its linemen after the mayor called for transparency. In the face of intensifying political and media scrutiny over the Whitefish deal—including revelations that Interior Secretary Ryan Zinke has personal and familial connections to the firm, which is also located in his hometown—PREPA canceled the Whitefish contract on October 26. Three different congressional committees, the House Committee on Natural Resources, the House Committee on Energy and Commerce, and the Senate Committee on Energy and Natural Resources, sent official inquiries letters about the contract on October 26. The Department of Homeland Security’s Inspector General and the FBI office in San Juan also announced independent inquiries into the contract, and the Whitefish deal was also the subject of several lines of questioning in a Senate Committee on Homeland Security and Governmental Affairs hearing on Tuesday. “Despite the contract cancellation with Whitefish, we continue to evaluate the circumstances surrounding the decision to award that contract,” a DHS OIG spokeswoman told me. She also confirmed that the impetus for the inquiry—which is not yet a full investigation—was media and congressional attention to the deal. While federal entities have yet to come to conclusions in their inquiries into Whitefish’s involvement in rebuilding Puerto Rico’s grid, the probe has already begun to broaden. A November 1 letter from the House energy committee indicates scrutiny over PREPA’s $200 contract with Mammoth Energy Services’ Cobra Acquisitions LLC, which was awarded on October 19 for repairing power poles and power lines coming in and out of San Juan. The letter states that that contract, “which would would appear to have the effect of preventing government oversight of the agreement, [raises] additional questions about the contracting review process,” including the exact involvement of FEMA in contracts paid out with its funds. According to a congressional committee staff member in communication with the office, the Department of Homeland Security’s inspector general may also be probing the Cobra contract. The spokesperson with the DHS OIG said of that claim that she was unaware of a formal inquiry into the Cobra contract, but that the office was involved “a full fact-finding review” of PREPA’s contract-making process, one that could escalate to a full-fledged audit. The Cobra contract does not contain some of the more eyebrow-raising language of the Whitefish document, but Mammoth Energy officials, who have not responded to requests for comment for this story, said in a conference callannouncing the deal that FEMA had been there “every step of the way” in the process (FEMA declined to comment when asked for confirmation). Of their deal, which also lacks a down payment and relies on FEMA to backstop any potential inability of PREPA to pay, a Mammoth Energy official stated that “we wouldn’t have entered this contract if we didn’t think we’d get paid.” Unlike the controversial provisions for lodging and expenses for Whitefish contractors, the Cobra deal houses line-workers in a barge that will float off the coast of San Juan. It’s still unclear how the contract-making process with Cobra was initiated, and as The Intercept reports, Mammoth Energy is a firm with little experience in disaster cleanup and little clear reason to be chosen as a partner firm, beyond the payment structure. But together with the Whitefish deal, the Cobra contract reflects ongoing concerns with the PREPA decision-making process after Maria. Just how did it come to terms with those companies? What exactly was its bidding process? Why did it choose to enter into expensive contracts with private companies instead of entering into the mutual-aid agreements usually favored by utility companies, which allows them to contract with other utility companies in other states for rebuilding services? And with Whitefish requesting that $10 million of its contract be paid from FEMA funds, who is liable for voided contracts, and for how much? The answers to those questions are forthcoming, and might shed light into an increasingly murky situation regarding an already beleaguered power company and Puerto Rico’s federally-mandated oversight board, which has already launched its own inquiry into the Whitefish deal, and has used the fallout as a reason for installing an emergency manager for PREPA. But even armed with those answers, the problems with contracts and the conflicts between the stakeholders involved in rebuilding Puerto Rico only mean that it’ll take longer for the lights to come back. And for some of the millions of people still without power, every lacking second is life or death.